I have given a low rating only because It is to early in the season to know if this product will work. Like that it is oversized to hang low and covers most of the body. Friesian mare Maaike fan Pleasant Hill in her new bug buster sheet. I love this sheet and it fits great, is soft yet durable, BUT it rubbed a bald spot on my horse's chest. She is a very wide chested quarter horse. I was very disappointed. This is a great fly sheet - just not for my horse or any chunky built horse. Fantastic Nothing Else Comes Close! Buy this Sheet if you care about your horse. Feels nice and well made but not a bug buster. After 2 hours of pasture time I noticed my horse had been bitten THROUGH the sheet. Found a blood spot on the sheet over his hip. I have to spray it to keep our greenheads and horseflies away. As far as the comfort goes, my horse hasn't said yeah or nay... Only splurged on this for the bug busting and that failed so overall I would say it certainly is not worth the price. This blanket best on the market. The Amigo Bug Buster is one of the most well made and durable blankets I have purchased. The fit is excellent and all of the buckles have velcro closures. 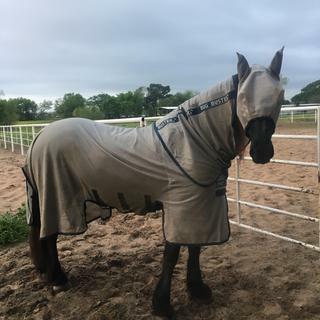 Amigo put much thought into the design as standing in the pasture with a light wind keeps movement of the blanket making it hard for flies to land.The detachable neck sheet stays in place with no slippage, I have not found one in the past that does. I was so pleased with this product I purchased two more for other horses with fly bite allergies. Yes. The Amigo version runs correctly. My horse is an 84" and this is perfect. I think so, yes. I'd round up instead of down when you order. Yes, at least for the 69" one I bought, and it really works! Most Customers tell us they feel this runs true to size. Yes it does. Very nice quality and wash up good. How does the neck piece stay on or attached? Do you have to leave a halter on your horse? The removable neck piece attaches with several velcro loops to the body of the sheet. It does not attach to a halter. Neck piece is detachable. Once attached it stays on. I don't leave a halter on my horses.